One of the rewards for the backers of the Death of Dulgath Kickstarter is seeing their name in print as I publicly recognize them in the acknowledgements. Of the 1,845 people that pledged, 1,393 chose to be added. A large number of people (more than 200) contributed at levels that I never dreamed possible so I wanted to give them a little special attention. I'm repeating the two lists here for two reasons. First, to give these people extra recognition, and second, so the contributors can check the spelling of their names to ensure I have them right before we put them into print. So if you are a contributor. Please check for your name below. If it is missing, or there is a typographic error that needs correction, please contact me right away. Also, keep in mind there are two lists - so please check both of them. It's a storytelling platform that is evolving how writers deliver content to readers. They create and distribute stories as serials with episodes created in collaborative story worlds called "serial boxes" Each box will contain several serials from different authors (about 10 each). Readers will receive new stories weekly. They are focusing on stories of science fiction and fantasy. 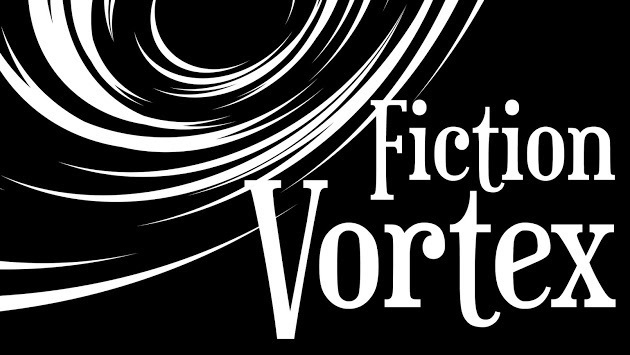 Right now Fiction Vortex is running a Kickstarter. I just backed it and if you think it might be interesting to you, give it a look see. I have news from my editor at Del Rey and I wanted to share it all with you. Also, if you know of any other lists that it would be eligible for, then please let me know. Second, movement is progressing on the covers. Tricia (my editor) and the Art Director (David Stevenson) have had several meetings regarding the cover of the book. I'm pleased to say Del Rey has been very receptive to feedback from Robin and myself and we are "on the same page" as to look and feel. Robin put together a massive undertaking, over 30 pages talking about our covers past, present, and future. It even mentioned the names of a few artists we would like to work with. It's my understanding that an artist has been picked, and it was one of our top choices. I don't want to reveal the name just yet...waiting for confirmation from the art director before I make an "official" announcement, but as soon as I can say, I will. For those who might not be familiar with this new project, it's a five-book series that is already written. Del Rey has signed the first three books in this series (and a yet to be named book in the world of Elan). Audiobook rights are also sold, and will be released simultaneously with the hardcover and ebook. Here's the current "back of the book blurb." What does it mean if the gods can be killed? In the land of the Rhune, trees can tell the future; raow can’t sleep before adding more human bones to their beds; crimbals steal children through secret doors in the forest, and the gods are beyond reproach. But Raithe does the unthinkable when his father is slain…he fights back. From this act of aggression rises the legend of the God Killer, the seeds of rebellion, and the question of whether the Fhrey are truly gods, after all. Before the Dark Ages, there was the age of Myth and Legend. Before kings and castles, there were mystics and heroes. Before Riyria, mankind lived in the shadow of the Fhrey, but that is about to change. 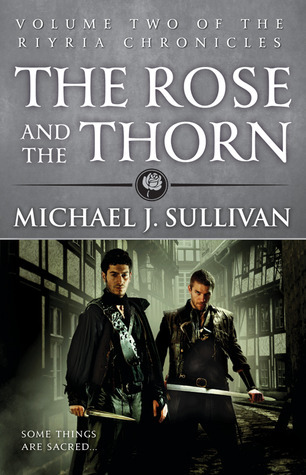 Discover a new world by Michael J. Sullivan, the best-selling author of The Riyria Revelations and The Riyria Chronicles. The First Empire is a standalone series, and all five books were written before the first one was published. While set in the same world as the Riyria books, it takes place thousands of years in the past. As such, no prior knowledge is required to enjoy the books to their fullest. For those who have read Riyria, you’ll discover certain details about Elan’s past weren't entirely accurate—the difference between myth and reality. Now you can learn the true story of how Novron saved mankind from extinction and founded the First Empire alongside Persephone, the love of his life. A reader of mine pointed me to this list compiled on BuzzFeed. I think it's a pretty good representation of the genre, and I even found some series that I didn't know about that I want to check out. Of course it goes without saying I'm honored to be included on the list. Thanks to Esther Rose for letting me know about it. Just wanted to remind everyone that I'll be doing an online Seminar on how to use Goodreads to further your writing career at 1:00 pm today (EDT). If you can't make it at 1:00 and think you might benefit from the class, sign up anyway. You'll get full access to it. The only thing you'll miss out on is the ability to answer questions, but if you email them to me afterward, I'll be more than willing to answer them privately. I should note that while the stop time is 2:30, I'll remain available until all questions are answered so there will be plenty of time for Q&A. I hope you'll check it out. I really think this is an amazing opportunity. I hope to see you there. Long time readers of this blog will know that I keep a note of various indicators that would let me know when I’ve “made it,” or when I can consider myself a “real author.” Those relatively new here, those who foolishly think I am An Author, might find this silly, but trust me, this is a thing. Every aspiring writer looks for signs that they’ve made it. Everyone likes to believe in the fairytale that there is a definitive point. As Neil Gaiman once put it: that night when he and Stephen King and J.K. Rowling show up at your door in hooded cloaks and hand you the scroll that reads: You are now an author, and give you the key to the secret author’s club. As much as I’d love for this to be true, it isn’t. There’s no finish-line, no diploma, no standard to look for. You’d think there was but the problem stems from a moving viewpoint. When you’re eight, your sixteen-year-old brother, who can drive, is a grown-up. But when you get your license you don’t feel grown up. You look at your older sister and realize she’s a grown-up by virtue of being able to drink and vote. She however doesn’t feel grown up. She’s still living at home, still going to college, hasn’t traveled, hasn’t married, doesn’t have children, and…you see my point? The reality is often that the “real” is that which is one level ahead of you. The same is true for being an author. Just writing a book doesn’t cut it. Publishing that book doesn’t either. Even selling it to a major publisher doesn’t; there are a lot of authors published through big houses whose first book fails to sell and their career pretty much stops. One failed book does not make a body feel like an author. Granted I’ve finally reached the point where I do find the “real author” label no longer feels too big for me to wear. Mostly this is because I pay my bills with my books. Still this is as personal as growing pubic hair. I know I passed a milestone, but no one else does. Given that so much of identity is perceived through the mirror of other’s eyes, it is this reflection that individuals seek—that they require—before they can affirm what they suspect, what they believe, what they hope is true. My dream goal is seeing someone reading my book in the wild. Given very few of the big names have even had this pleasure, I’m not holding out hope. 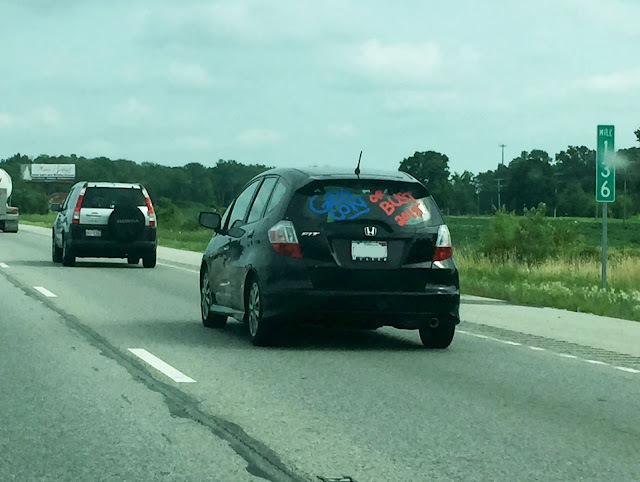 The closest I got was a friend of mine seeing someone and taking a picture to prove it. I still search for indicators of outside acceptance beyond that of sales to give me a sense of how readers perceive my work. For the final assessment of all things comes down to them. As the odds of meeting a reader in the wild are slim, I don’t see many (any) blips on that radar. The sheer saturation levels at conventions improve the odds, but traditionally these have been exercises in humility. In the early part of my career, I went to several and the experiences were not positive. Even after publishing through Orbit I would sit for signings—just me and my placard, clicking my lonely pen. No one asked for my signature. 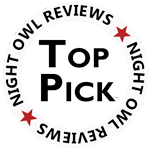 This experience is about as much fun as reading the one-star reviews of my books, only more public. Then in 2012, at Balticon, I had a reader pick me out the crowd and ask to shake my hand. His was quivering. Assuming he didn’t suffer cerebral palsy, this marked the first time I had encountered a fan—a fan who clearly thought far too much of me. Half a dozen readers remained the record for the most in one place at the same time. The odyssey began with a drive through windmill farms to Indianapolis. Despite having been born and raised in Detroit, I’d never set foot, or wheel, in Indiana. Aside from the windmills—giant white waving monoliths that extended like the front line of a giant army all the way to the horizon—the only other thing of note I spotted on the freeway were cars with rear windows painted with the slogan: “GenCon or Bust.” This, I made an educated guess, would be bigger than Balticon. 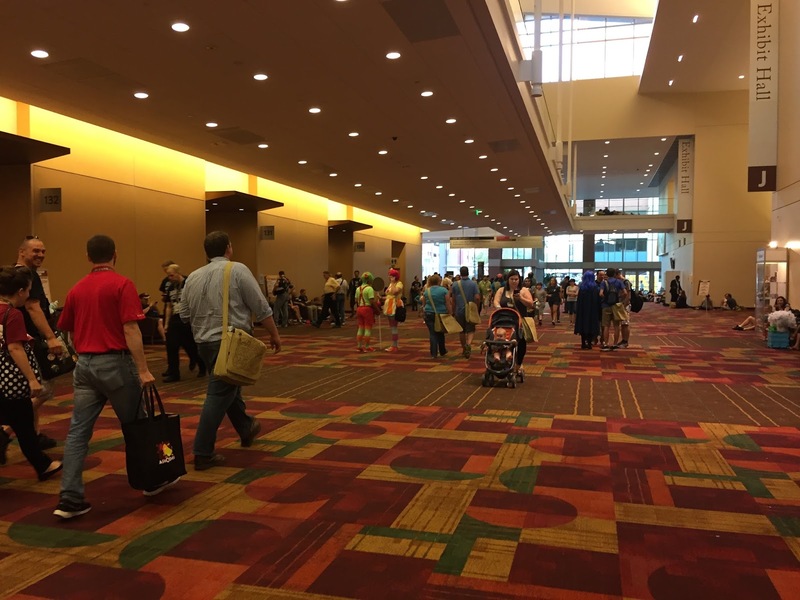 GenCon is a gaming convention. It is in fact the largest table-top convention in North America. Established in 1968 by Gary Gygax the creator of Dungeons and Dragons, it could be considered “the” gaming convention. The name is a bit odd though. Is it short for Generic Con? Generation Con? Genetics Con? Actually the name is short for Geneva Convention. Yeah, I know, odd right? Why not GamerCon? Apparently it started at Lake Geneva in Wisconsin. Go figure. Billed as the best four days in gaming, it is indeed game-centric, and huge. The exhibition halls are massive airplane hanger types of spaces filled wall to wall with gaming paraphernalia. 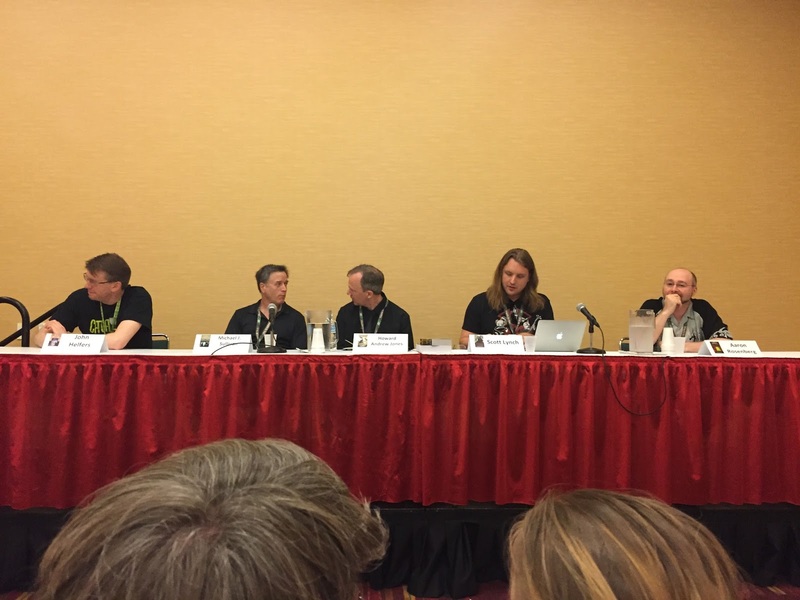 I was there because GenCon also sports a quality writer’s symposium. This is something they can manage handily as a large number of American authors live in the monetarily-friendly midwest that allow them the dream of going full time. Either that or there’s just something in the corn. The usual faces were there. Wesley Chu, Brad Beaulieu, Brian McCellen, Sam Sykes, Scott Lynch, Elizabeth Bear, and Django Wexler. I was on a few generic panels where I tried to appear knowledgeable and charismatic. At the end of one about Branding Yourself, two people approached me. I assumed they had questions as people often do, asking things such as, “What was that website you mentioned?” Only these two were smiling too much. The first guy stumbled over his words. “I’m a—I’m a huge fan.” He struggled to pull a book out of his backpack. Theft of Swords. I fought the urge to kiss him. There was a woman at his side. I assumed she was the doting wife or girl friend patiently letting him do his nerd thing with the nerd author, which she would later parley into a romantic dinner where he would need to wear a tie. He gushed, and I worked hard at acting cool as I signed the book to Evan. When there was a lull I smiled at the woman thinking Evan would take that moment to introduce her. He didn’t. “I’m a big fan too,” the woman blurted out. I couldn’t imagine that two readers of mine could be in the same place independent of each other. They didn’t come to this panel to learn about branding—they came to see me? I talked to them for ten minutes like I was on a speed date with a supermodel who seemed in to me. “Thanks so much for taking the time to talk to us,” Evan said. This one sentence stayed with me all weekend. Thanks for taking the time to talk with us, as if I had better things to do. Maybe they thought I was this close to finding a cure for cancer. More likely they suspected I had another panel to be at, or more important folks to chat-up. I wanted to explain that if all the heads of state, the world’s greatest minds, and most famous people were gathering in that hall, I wouldn’t notice anyone else but them. These two were the equivalent of a pair of unicorns and I had found them. My wife came over laughing. “I was in the other room,” she told me with this expression of giddy disbelief, “And this woman looked at me and pointed at my shirt.” She was wearing a Riyria T-shirt. “And she said, ‘Oh! I love him. I’m so going to be stalking him this weekend.’ I was certain she had you mixed up with someone else. So I said to her, ‘Michael J. Sullivan?’ and she nodded.” My wife looked as shocked as I was. This doesn’t happen. Ever. Another reader wanted to take us to dinner after that. Then Robin and I were sitting in the lobby of the hotel next to the convention when a husband and wife approached and asked if they were intruding. We assumed they were asking if the other nearby seats were taken, but no—they were readers. They had recognized me and were excited to tell me how much they enjoyed my books. This was getting weird. Great, but weird. I asked them to sit down. They appeared shocked, but eagerly joined us so they could burden me with how much they loved my work. I’d like to say I was mobbed at GenCon. I’d like to report that people fished my discarded coffee cup out of the trash bin and gingerly sealed it in a ziplock bag, but that didn’t happen. What did happen was that I was approached by a new record high of nine unrelated fans. Nine. Other things happened at the convention. I really don’t remember them. But I remember: Evan, Quinn, Zoe, Alexi, Holly, Kate, Kris, Eric, and Beth. Thanks for making me feel like a real author. 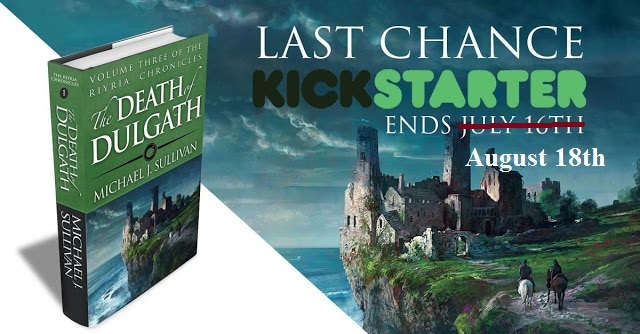 Yes, the Kickstarter ended on July 16th, but that doesn't mean people aren't still joining the party. In fact, we've had 53 more people join the ranks since it's end on July 16th. But the window is closing, and I can't believe I hadn't blogged about it before, so let me take just a minute to explain. I'm using Backer Kit to help with fulfillment, and one of the things it provides for is the ability to purchase add-on merchandise like posters, t-shirts and tote bags. But in order to have these things created I have to "lockdown" Backer Kit so I have numbers to give to the various companies doing the printing. So, this is how it works. Using my special Death of Dulgath store, you can chose a reward level and use Paypal for it's purchase. Robin (my wife and the logistics guru) sets you up an account in Backer Kit. You go into Backer Kit and answer the survey that provides the "bonus" stuff that is available ONLY to Kickstarter members. Things like having your name in the acknowledgements, getting signed posters and bookmarks, and entering into a number of giveaways exclusive for those who backed the project. If you want any of the "add-ons" you can add them to a cart in Backer Kit and pay for them from their store. So what are some of the things available in as add-ons? 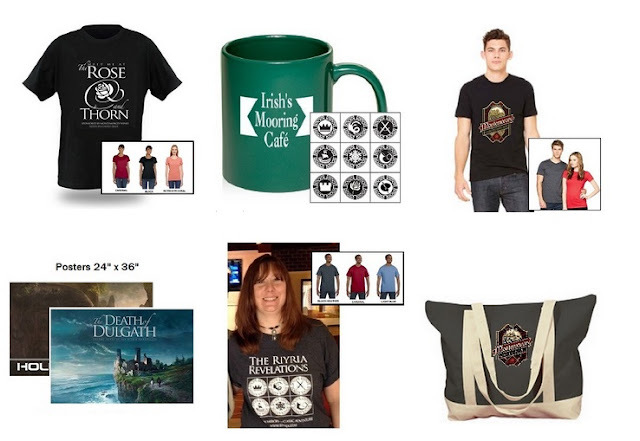 Well you can see them all, along with the prices for each from this link. I've long said that one of the keys to my success regarding marketing my works was figuring out the best way to utilize Goodreads. A site dedicated to reading is an obvious place to get your work known, but most authors I've talked to find it difficult because there is so much to do there. It also doesn't help that there are pitfalls that many stumble into which can hurt rather than help interactions at that site. These have gone over extremely well but there have been issues. The article, which while great, can only scratch the surface. The seminars have required travel and event fees that has put the seminar out of reach of a lot of writers. Well, I've teamed up with Writer's Digest to do an online course to help that and try to get the information out to a wider audience. 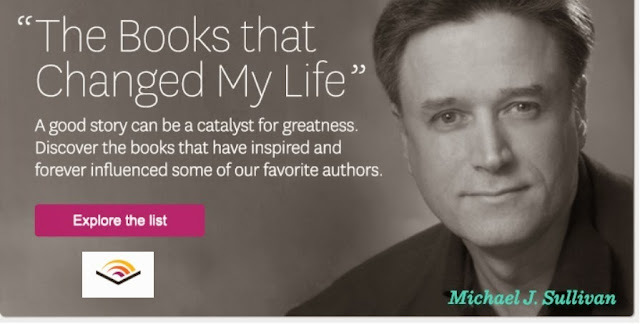 While I suggest you join the seminar live (so you can answer questions), Writer's Digest does usually record the sessions and makes them available after the fact if timing doesn't work for you. Also, when you attend live, you'll have access to re-watch the session as often as you like. Hey all, Robin here, taking over Michael's blog again. It's 3:26 AM and I've finally got the beta tester notifications completed. Competition for this beta was fierce. We had more than 970 people answer one of the two surveys, and after removing duplicates and accounting for people who had scheduling conflicts, I had to select from 890 applicants. It was hard turning people down, so I’m running my largest beta ever…55 participants!! Still, even with that large number, it means I could only accommodate 6% of all people who applied. Everyone who answered the survey (and who didn't bow out because of conflicts) has been notified. To process so many notifications I had to use Mail Chimp for some of them. Having used this tool in the past, I know it's not uncommon for the message to go to a spam folder, or for those that use gmail, the promotions folder. If you look around and can't find your notification, feel free to send an email to riyria.beta@gmail.com and I'll look you up to see which list you are on. As for the delivery of the manuscript. I'm still on schedule for August 17th. We (Robin an I) are on the road (traveling back from Gencon). This has put her behind on selecting (and notifying) beta readers. So, don't be freaked if you've not been notified yet...because no one has. She is hoping to be able to get them out later today, but if not...don't worry - I'll be posting when they are available.